Over the last six months, Nicolás Correa Service, S.A. has retrofitted and sold a total of four CORREA CF17 bed type milling machines, all installed in industries in Spain. This is a clear indication of the current rise in the demand for CNC milling machines of this size in the metalworking industry in Spain. These CORREA CF17 fixed bed milling machines feature independent guideways with tempered steel inserts and friction counter-guides on all three axes. The machines are equipped with tempered and ground ball bearing spindles in all movements and, additionally, a hydraulic counterweight for the vertical movement. All the milling machines are fitted with an electronic hand wheel and universal head with a hydraulic tool clamp, and are therefore ideal for the precision machining of parts, with an X axis travel of 2000 mm, and 800 mm on the Y and Z axes. With regard to these four milling machines, particular mention should be made of the CORREA CF17T, given the fact that it was equipped with a Heidenhain TNC-530 numerical control, which is more up-to-date and versatile than the controls in the other bed type milling machines. This machine was sold and installed at a metalworking shop in the province of Madrid. This workshop, with a history of more than 30 years, also required NC Service to include an internal coolant system through the spindle. The latest mechanically retrofitted milling machine to be completed at NC Service was the CORREA CF17D. The geometry protocols and final operating tests have been conducted over the last few days and the machine is now set to be installed at the beginning of March in a company in Asturias, dedicated to the manufacture of greenhouses. With regard to the other three CORREA CF17 machines, the first in this series was once again sold to a company in the province of Madrid, which is a leader in the manufacture of screening media. 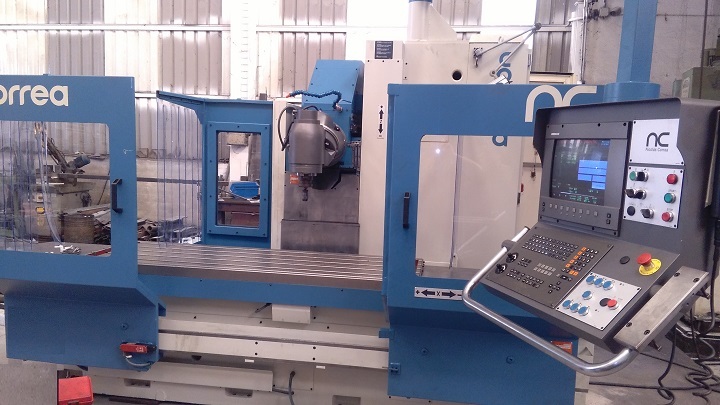 Another CF17 was sold in Zaragoza, to a company manufacturing and distributing screws and derivates, whilst the last machine to be sold in 2016 was installed in a company in the province of Málaga, focussed on the manufacture and maintenance of mechanical parts and components. Therefore, the metalworking sector in Spain is currently the ideal market for milling machines of this type; fixed bed milling machines offering high performance yet compact in size and with the precision of a great CORREA milling machine, thanks to the retrofitting work carried out by NC Service.